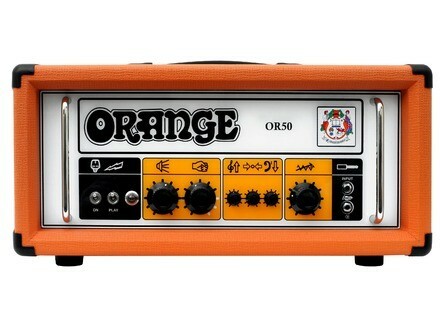 OR50H Reissue, Tube Guitar Amp Head from Orange in the OR series. The OR50H is not a new product. It belongs to the "Pics Only" series launched in 1972. It's a legend in amplification history and its "so British" sound had a great impact in the destiny of the manufacturer. 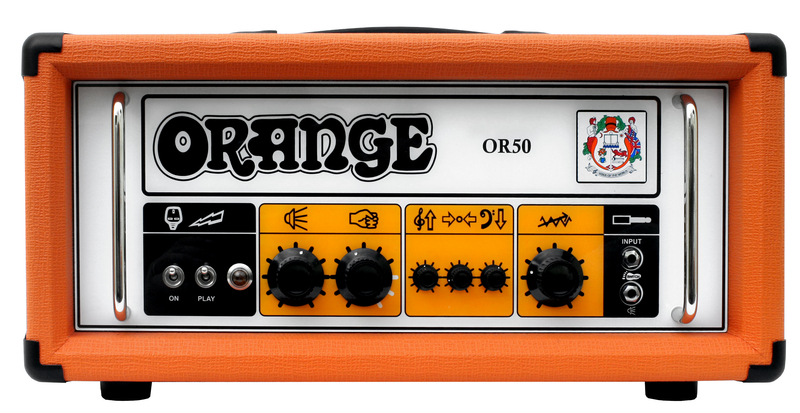 Now Orange has decided to reissue a limited version of the amp for its 40's birthday. 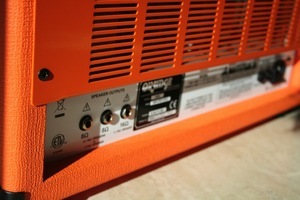 The idea was a great success and Orange decided to add this amp indefinitely to its product range. After this short story, it's time to unpack the amp. Since I'm rather small (I wonder why people call me "Willow"...), the cardboard box seems giant. I open it and discover a monster (21.6" x 10.2" x 9.4") inside. After warming up I take out the 42 pound amp, which is almost the same weight as its brothers with the same output power. I put it on top of my small 2x12" speaker cabinet. The finish quality is perfect. The wood housing is sturdy and protected with a thick orange vinyl covering that will easily withstand the attacks of wild animals and hysterical groupies. 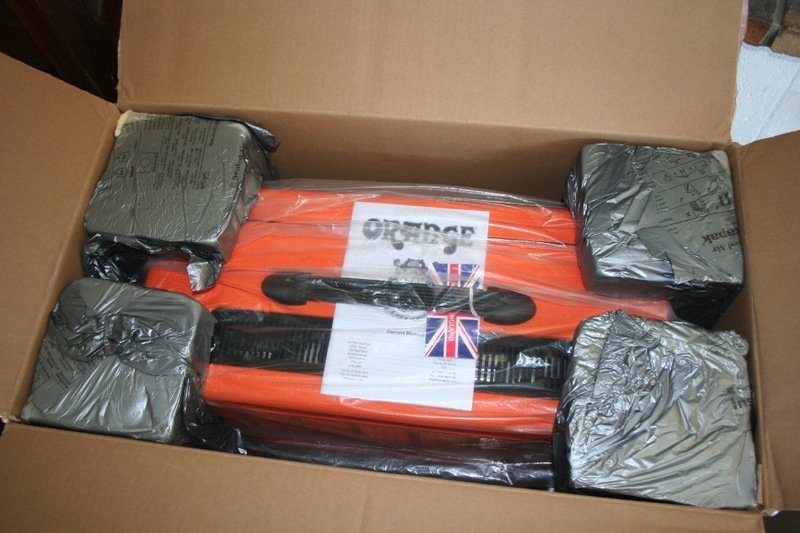 The front panel has the typical look of the brand. 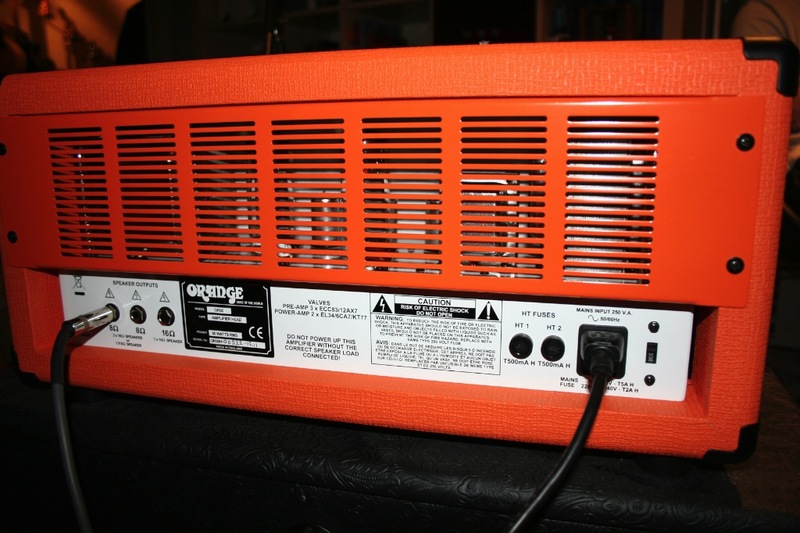 It is equipped with only six controls described with pictographs instead of text, like the original '72 amp. That's the reason for the nickname of the amp: "Pics Only". The front panel features two 1/4" inputs (the first one for your guitar, the other one for the footswitch), a Gain control, a 3-band EQ, a HF Drive setting, and a Master Volume, plus a Standby and a Power switch. The control panel is simple and it looks nice — living up to the reputation the brand has earned throughout the years. The rear panel also looks interesting: power outlet, two fuses and three speaker outputs (two 8 ohm plus one 16 ohm). So, you can connect either one 16-ohm, one 8-ohm or two 16-ohm speaker cabinets (one to each 8 ohm output). The design matches the legend: sturdy, beautiful, simple. No nonsense under the hood, only heavy-duty components: two EL34, three 12AX7 and two massive transformers! Now you know why the amp weights so much! It's time to start strumming. Since it's all about rock music, I grab my Les Paul Studio. I start checking the clean sound by setting all controls at 12 o'clock except the gain control (set to 3). All fans of the brand will immediately feel at home. 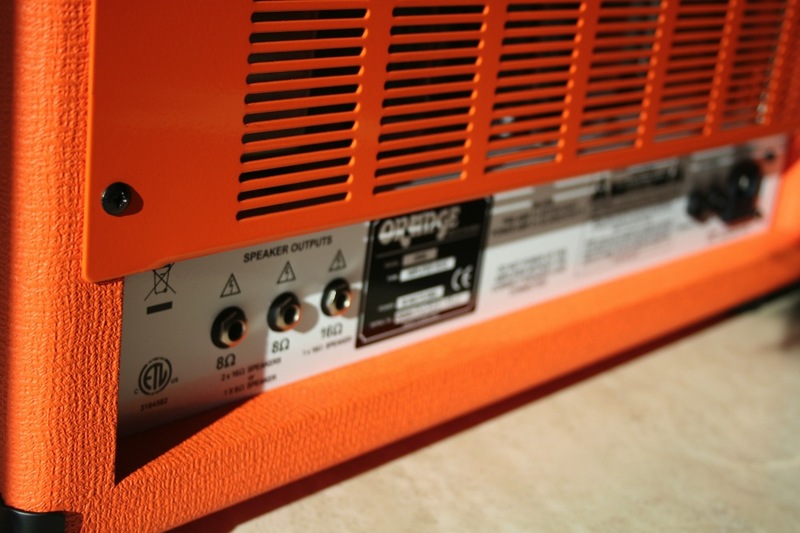 In clean mode, the amp has a wide dynamic range and produces a warm and well-balanced tone. The EQ controls work and complement each other perfectly: within a few seconds you can change from a twangy Hiwatt style sound to a warm tone with heavy bass-frequency response. Rock, pop, funk, ska, blues, etc. players will easily find their own clean tone. I set Gain to 3, Bass to 4, Mid to 3, Treble to 6, and leave everything else set at 12 o'clock. This sound is ideal for "Old Love" and for arpeggios in "Tears in Heaven" (nobody's perfect...). I increase the gain to center position and the sound starts biting. The "HF Drive" control turns more interesting: it works like a regular presence control but it also seems to increase the distortion added by the power tubes. 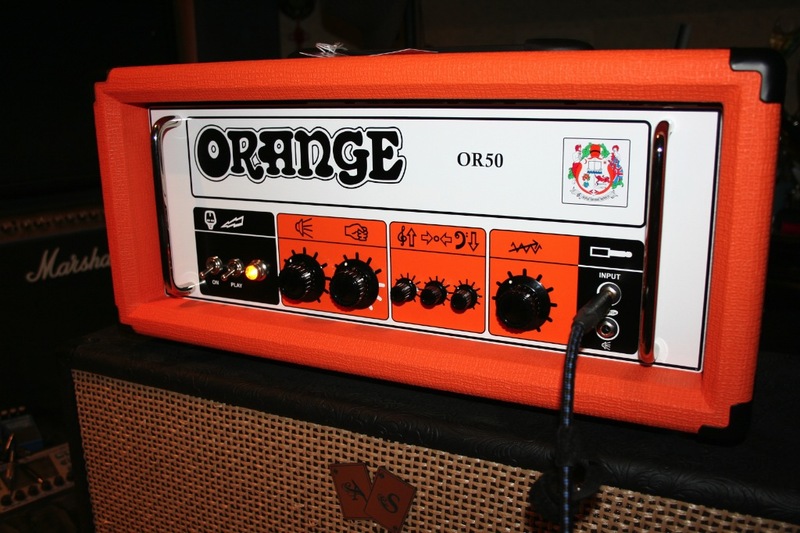 It reminds me of the "Shape" control on other Orange amps. It allows you to create either a dark sound or a sharper and more aggressive tone. I then set "HF Drive" to 7 and Gain to 6. With the bridge pickup, I get a Jet-like sound ideal for "Are You Gonna Be My Girl". With even more gain (set to 8), the sound becomes heavier and is perfect for "Whole Lotta Rosie". You can get very high distortion amounts for angry riffing! Now, it's time to record the amp. The amp head was connected to a 2x12" Greenback speaker cabinet recorded with a SM57 microphone and my EMU sound card. I will play the same part while turning only the "HF Drive" control to show you the effect it has. Still with my Les Paul Studio under the arm I decrease the gain and increase it progressively. For a comprehensive review, I also take a Fender Mexico Telecaster and a Marauder. 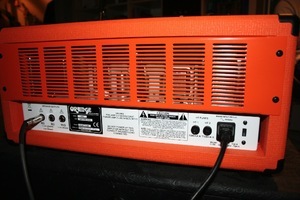 The 50-watt output power is enough for all possible applications: at home, for rehearsals with a band and even on stage. In spite of the Master Volume control, the amp tends to be very loud, which could result in the worsening of the relations with your neighbors. I missed an effect loop (luckily the amp works very well with stompboxes) and a reverb. 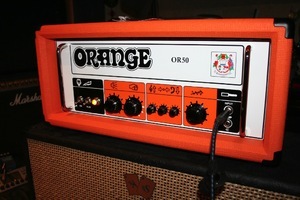 Were Orange to add these two features, the amp would be almost perfect. If you think a single-channel amp isn't for you, try the following: first, set your distortion sound with the bridge pickup (for instance), switch to the neck pickup and decrease its volume until you get a clean sound. Now, switching between clean and lead sounds is a breeze with the toggle switch. Some words about the footswitch (no, I didn't forget it! ): it allows you to enable/disable the Master Volume, which can be convenient on stage to have a nice boost for lead parts. This OR50 amp made in England brings us back to the roots of the typical Orange tone — which makes us very happy! Do you like vintage tone and old-school distortion? This amp is for you! With its sturdy construction and 50 watts of output power, this amp will follow you to every gig and rehearsal, and even to your home thanks to the Master Volume control. 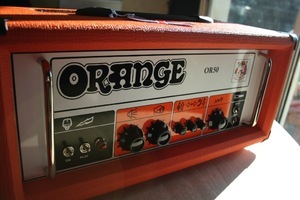 But unfortunately, this amp is not affordable for everyone: it goes for about $1700 — quality has a price.